Experts in heating, air conditioning, and plumbing service for decades! 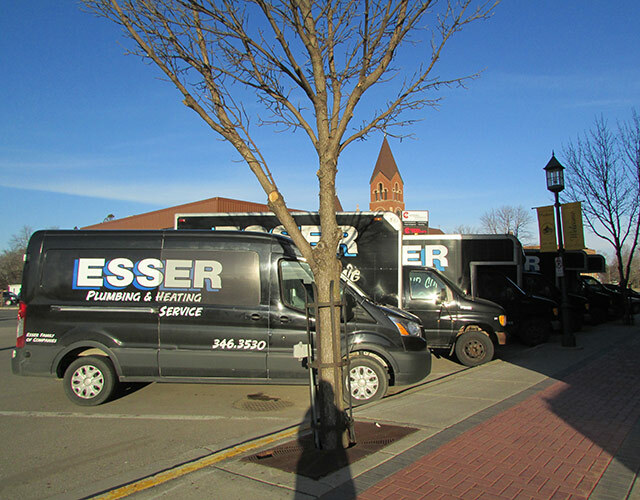 The experts at Esser Plumbing & Heating build on decades of exceptional service and installation experience to meet all of your plumbing, heating, air conditioning and geothermal needs. We routinely perform commercial and residential installations and services throughout the Lakes Area in Minnesota and the Fargo-Moorhead area. Call Esser Plumbing and Heating or Aire Serv to ensure that you receive quality work from a company that will stand by you for generations to come. Our mission is to perform for our customers the highest level of quality services at fair and competitive prices. We also work to ensure the longevity of our company through repeat and referral business achieved by customer satisfaction in all areas including timeliness, attention to detail and service-minded attitudes. This also means that we will maintain the highest levels of professionalism, integrity, honesty and fairness in our relationships with our vendors, subcontractors, professional associates and customers.